Ask the Captain: Which is the safest seat on an airplane? Hi Lyn, you're not alone in trying to figure this one out. The question might seem like an easy one to answer, but isn't necessarily so. First, there is absolutely no way to know what situation might occur on any given day on any given flight. For example, take the incident that happened on a Delta Air Lines flight bound for Atlanta from Pensacola in July of 1982. The MD 88 had a catastrophic engine failure on spool up for takeoff. Two jet engines are mounted on the tail of the fuselage, one engine per side. The engine on the captain’s side came apart sending the fan blade, now acting like a rip saw, cutting through the rear fuselage. Unfortunately, there were folks sitting in those exact seats. Seats that on any other day would've been perfectly safe. So, where is the safest part of the airplane? Well, the flight data recorders are in the (rear) tail section of most aircraft for a good reason. This section usually survives most critical impacts with the sea or terra firma a.k.a. Mother Earth. Answering your questions in our NEW ASK THE CAPTAIN column is, Michael Wiggins, a retired airline pilot who has spent the better part of his life shuttling passengers around the globe. 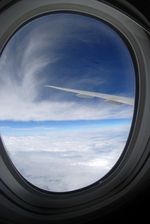 Do you have questions for YourLifeIsATrip's airline pilot? Submit your question and look for answers in a future column.